Comment: All actions have consequences. This is a lesson that children and adults alike learn multiple times throughout their lives. Cecily Beasley learns this the hard way. She is a rude, obnoxious child that acts without thinking. One day as she is making a face, her tongue gets stuck and a bird makes a nest on her tongue. Cecily has to wait for the eggs to hatch. As she is waiting for the birds to leave her tongue, Cecily realizes the way she has been acting, and chooses to be nicer moving forward. David has to learn to accept the consequences of his actions, just like Cecily. The assigned reading for this morning, does not tell us what David’s consequences are for his actions. After hearing the parable Nathan tells David, David responds with “I have sinned against the Lord” (12:13). These words make it seem as if David is willing to accept the consequences for his actions. Like David and Cecily, we will all make mistakes, but how we respond to them is what is important. David and Cecily were able to accept the consequences in a way that allows each of them to move forward. Comment: Paul writes to the church in Ephesus, “but speaking truth in love, we must grow up in every way into him who is the head, into Christ” (4:15). Children are in the midst of growing up. Many of them look forward to reaching the next stage. Paul reminds the adults and children alike in the community that we are to grow up in Christ. We are to grow up in a way so that patience, gentleness, humility and love are ingrained in our being. Growing up is not easy work. 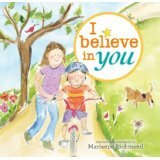 Marianne Richmond in I believe in You acknowledges the difficult aspects of growing up. Richmond describes the problems that might arise for children on any given day, and offers encouragement to continue moving forward. Richmond and Paul remind the community that growing up is difficult, but we have people who are looking out for us and cheering us on. The children of the church have the church community that vowed to help them grow up in Christ during baptism. We are never alone as we seek to grow into Christ in every way. Comment: In My Spring Robin, a little girl sees all the signs of spring around her, but cannot believe it is spring until she hears the robin. The little girl sees the bees, smells the flowers, feels the sun, and experiences the rain, but cannot believe that it is springtime yet. Because the little girl has her mind set on finding one specific sign, she is unable to see the signs that are showing her spring has arrived. The Gospel passage is a story of people looking for Jesus. It seems to me the people searching for Jesus have seen, heard about and experienced all the wonderful things Jesus has done, but they still ask for a sign once they find him. The people have spent all this time and energy looking for Jesus, yet they still need a sign. Like the little girl, the people are so focused on seeing a special sign; they are unable to see what is right in front of them. Unlike the little girl, the people do not get the sign they requested. It is important to remind children (and adults) to be present in the moment, so that we can find Jesus and see the signs of his presence. When we are expecting something particular, we almost always miss what is right in front of our eyes. Thanks to Elizabeth Boulware Landes, Union Presbyterian Seminary graduate and Director of Children’s Ministry at Faith Presbyterian Church, Aledo, TX, for writing the Lectionary Links for the past four weeks. Lectionary Links: Sunday, August 2, 2015 by Storypath is licensed under a Creative Commons Attribution-NonCommercial 4.0 International License.